The BenRiach Dunder derives its name from Rum production. The residue cane juice left in the still after the Rum has been distilled is used as a source of yeast in fermentation. Unsurprisingly this whiskey has been finished in a Jamacian Dark Rum casks giving it plentiful treacle and toffee apple notes. Taste Roasted apples and pears dusted with demerara sugar and lemon peel, all infused with a crisp barley sweetness and lingering wood smoke character. Nose An intriguing, delicate floral, peat smoke floods over cinnamon-spiced apple sponge. Crisp white pepper adds a gentle warmth to the nose. 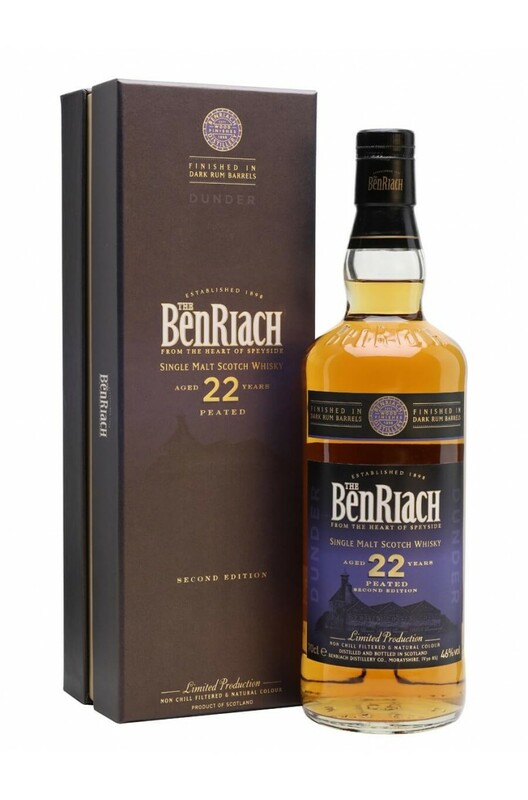 A superb limited edition Benriach that has been finished in sweet moscatel wine casks which were sou.. The new BenRiach 30 Year Old Authenticus has been brought out to replace the 25 Year Old and it does.. Initially matured in American Bourbon barrels, this Speyside single malt was additionally finis..